Today I had the pleasure of meeting with Ms. Smart's k-1 combo class again. They're a group that has interesting personality and good focus. I meet with them in my kindergarten rotation, but I gear the lessons to 1st grade standards. I did a lesson that revisited the use light and dark to create volume. We created cylinders and spheres with line, shape, and value. I was looking for something that would be a little fun and I turned to Mr. Thiebaud. 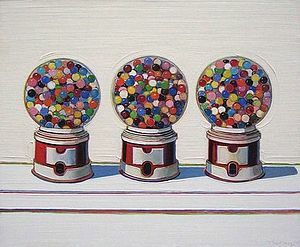 Wayne Thiebaud, he of the paintings of pies, cakes, ice cream, and gumballs. We looked at this one and I talked about Wayne's use of light and dark to make the painting look so real. After this we did a directed drawing to create the cylinder and sphere. We added smaller circles to the inside. Some wanted their machines full, and some wanted them to look like pieces were already eaten. We then added value to the cylinder and table. The kids did a great job altering hand pressure to make light and dark colors. This is such a difficult skill to master and they rocked it! nice shading, 1st graders! way to go.